Deserts cover about one-third of the Earth's land surface. The World Desert map shows the types of deserts and their locations around the world. Covering a combined total of about one-fifth to one-third of the land surface of the Earth, deserts are landscapes or regions that receive little precipitation, with a relatively high level of evaporation, creating a deficit. Areas designated deserts have an average annual precipitation of less than 16 inches. The combination of light rainfall and high evaporation creates a dry, arid environment, and one of the Earth's major ecosystems. Since water is a vital resource for every life-form, a limited array of organisms can survive in deserts. Plants and animals in desert habitats have adapted to survive in the harsh conditions of deserts. For example, many of the plant varieties in deserts have no leaves, reducing water loss, and they may have very deep roots to absorb water from deep below the earth's surface. 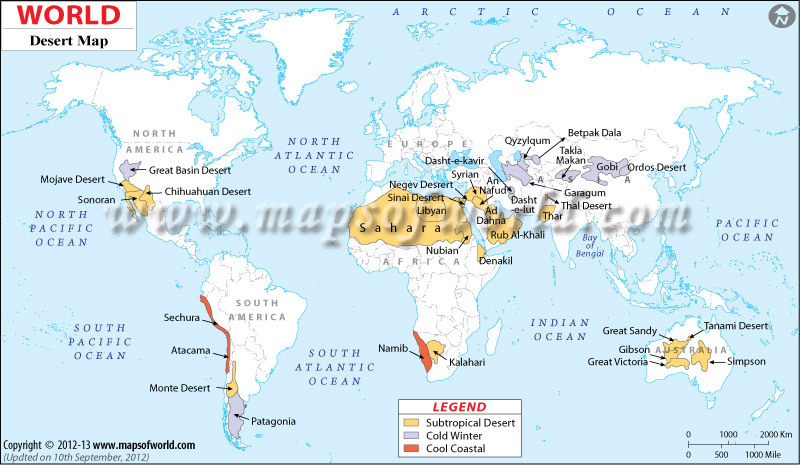 There are several types of deserts on Earth, defined based on the temperature of the region. There are both hot and cold deserts, classified into semiarid, arid, and extremely arid or rainless deserts based on the total annual precipitation. Although some definitions of the desert also include areas that are too cold to support vegetation, such as frigid deserts, the world desert map shows the distribution of only those areas that are conventionally termed as hot desert and temperate deserts. Polar deserts, which are located over the North and South Pole, are also not shown.